For the longest time, travel has been considered an obstacle to wellness—it’s dehydrating, it takes you away from your favorite boutique fitness classes (unless you’re Lady Gaga), and don’t even get me started on those mini-bars stocked solely with candy and booze. But that’s all changing, thanks to a growing number of hotels that are enabling health-conscious travelers to keep up with their at-home habits even while on the road. What’s even more surprising is that those leading the charge aren’t just cooler-than-thou boutique hotels (though they’re definitely major players). Some of the biggest brands in the world are making wellness a priority, which means that you can get in on the trend even if you’re traveling for business or on a budget. Read on to discover how eight hotel groups are making it easier than ever to stay healthy on the road, with everything from coloring books to in-room Pilates and superfood room service. Functional medicine pioneer Frank Lipman, MD, is giving this mega-chain a healthy boost—his holistic health brand, Be Well, has partnered with Hyatt to bring select locations good-for-you refreshments and snacks, as well as added fitness amenities. He and chef-restauranteur Seamus Mullen trained a couple dozen chefs at various Hyatt brands to bring cleaner (an delish) menu choices, such as Be Well’s healthy take on the BLT and a bun-less Paleo burger. Wellness perks: Be Well supplements and shakes stocked in minibars; 24-hour gyms; collaborations with the likes of MNDFL meditation in New York City and Shred415 fitness in Chicago; nutritious on-the-go snacks and other non-junk food options. Locations: The partnership is initially rolling out at Park Hyatt locations in New York, Chicago, and Washington, DC, and will then expand to other Hyatt brands. A hotel brand that has superfoods on the menu? Oh, it’s a thing. 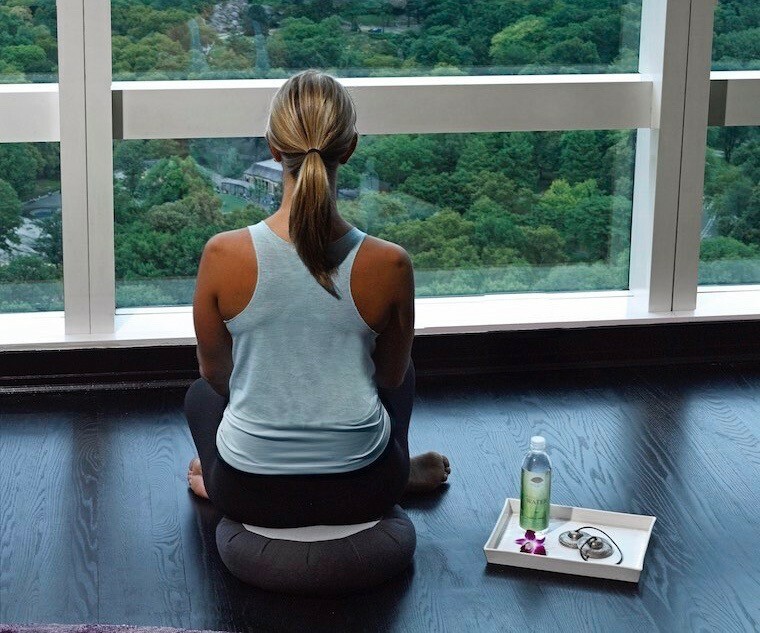 Westin’s wellness revamp makes you actually want to skip your cheat days while traveling. The megachain’s wellness program offers health-oriented amenities that have all of the pillars covered, from sleep to food to fitness. Wellness perks: A running concierge with coach-led runs an route maps, New Balance gear-lending, a SuperFoodsRX menu (including dishes focused on sleep-enhancing superfoods), nourishing juices and smoothies by The Juicery, rooms furnished with treadmills and stationary bikes. Locations: All over the world—seriously. The mid-priced hotel group knows how hard it is to get motivated to work out at a lackluster hotel gym—so they’ve made fitness amenities, as well as healthier food options, the centerpiece of a good (and healthy) night’s stay. Plus, they’re eco-friendly—providing wellness for not just you but the environment as well. Wellness perks: An in-room customized workout station with guided videos and fitness equipment (resistance bands, a Pilates ball, and a yoga mat, for starters), group fitness classes, and cafes stocked with only healthy food like protein smoothies and quinoa wraps. Locations: All EVEN Hotels in New York City, Nebraska, Connecticut, and Maryland. The boutique hotel brand—which encompasses the Delano and Mondrian in Miami’s South Beach and Clift in San Francisco, among others—has launched a new wellness program aimed at reducing guests’ stress via mindfulness and physical exercise. Wellness perks: Adult coloring books, for starters. Guests also get a complimentary download of the Buddhify app, which offers travel meditations, as well as access to property-specific fitness collaborations (like the Mondrian Run Club in South Beach and a partnership with YogaWorks in San Francisco). Locations: Morgans properties in New York, Miami, Los Angeles, San Francisco, Las Vegas, London, and Istanbul. It’s no surprise that chic Manhattan hotel Dream (a model and celeb magnet) is hip to all things wellness. This summer, Dream’s two locations in New York City are offering summer packages in collaboration with nearby fitness studios and juice bars. Wellness perks: Dream Downtown’s “Brain, Booty, & Beauty” package includes daily sunrise yoga, a healthy dinner at the hotel’s restaurant, Liquiteria juices, a SoulCycle class, and a scalp massage and blowout at the hotel’s salon. Plus, the midtown location is offering bike rentals for two. Locations: At the moment, just NYC (Chelsea and Midtown). You might not realize this, but the upscale brand is into holistic health, and offers not only relaxing, de-stressing spa treatments but therapeutic remedies too. Wellness perks: Each location has different amenities, which can include private and semi-private yoga sessions, meditation and Pilates classes, organic vegetable and herb gardens, and farm-to-table dining, among other perks. Locations: Colorado, Arizona, Hawaii, Florida, California, Toronto, Mexico, Latin America, Puerto Rico, Spain, Portugal, and locations in Asia-Pacific. With a new Vitality Program in place, Swissôtel aims to have its guests feel as good on the road as they do at home. The concept brings organic, healthy foods and fitness equipment to your room, making wellness while abroad not so out-of-reach. Wellness perks: In-room fitness equipment (including a Swiss ball, natch), a large selection of healthy food, Vitality On-the-Go packages—with a 25-ounce S’well water bottle and adult coloring postcards—and mindfulness podcasts. Locations: Select hotels in Chicago, Istanbul, Sydney, Berlin, Zurich, Singapore, and Germany. If you’re a Pilates or yoga addict and hate to give it up while away from your local studio, book a room at the Mandarin. They’ll bring your favorite workout to your bedside—talk about room service. Wellness perks: Fitness offerings vary by location, but options include in-room yoga and Pilates sessions; group workouts such as tai chi, belly dancing, and boot camp; in-suite or group meditation; and totally personalized sweat sessions. Locations: Las Vegas, Miami, New York, Boston, Atlanta, Washington, DC, as well as locations in Asia-Pacific, Europe, the Middle East, and Africa. But now—how to pack? Check out our active girl’s guide to packing for any destination. And be sure to remember your healthy snacks—here’s what wellness experts bring on the plane.